Thanks, @tv_capper - I've made those changes. Thanks very much, @Mark.Alexander - that's really useful; Huddersfield kit numbers were set incorrectly, in the database. Saints numbers are set correctly, but I'll check that the plain shirt back feature is working. Hope the pan scrubbed up as good as new! @Mark.Alexander - in the database, there is a plain, red back to the shirt, so it's a bug, and been reported, ta. We can set a club to have a future training ground move, as we can for a future stadium move, but will only do so if all the permissions/planning etc has been approved. Ben Woodburn has both a recall clause and a "Play in reserves" clause in his loan contract with Sheffield Wednesday, as he was playing in the Liverpool u23s the other day. @JordanMillward_1 Thanks, I did see that and I didn't know he had had a recall clause. Thanks @jkadms - none of those players are being listed for loan, or transfer, in any soak games that I have run. Sané was transfer listed and Mendy loan listed (joined PSG on loan) on mine. Problem of actual staff in a role being higher than the advised (aka allowed) number. Shouldn't advised staff numbers in any role at least be equal to the actual when the game starts? Taking Liverpool this season, they have 5 physos but are advised/allowed 4. They also have 20 scouts but are allowed 16. Given FM19 is a simulator, I'm guessing its not a managerial challenge to sack multiple staff if you want to change one, (ie at Liverpool if you want to add one scout you'll have to sack or change roles of 4 other scouts). This would suggest that when real staff are added to the database the advised/allowed figure has not been amended. Looking at the pregame editor database that we as customers use, I can see how this can happen as there is no instant link when adding a staff member, to the part of the database where allowances are logged. 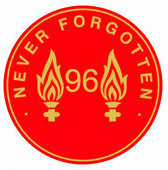 Please can the Liverpool advised/allowed numbers be amended to not be lower than actuals. Suggestion: A routine be written to automatically amend the number the advised/allowed numbers for staff so they are never lower than the actual on the default database for everyone. Unless I'm really missing something, it was widely reported Zidane turned down the oppourtunity to sign Kepa for circa £18m. 6 months later Chelsea spent £71m on him. I just don't understand why people are comparing him to other GK's after 10 games and claiming that GK is hence "overrated". The respective researchers have watched these players for a minimum of a complete season, not the odd highlight or the first 10 games of a Prem season. "He will reach the same level of De Gea after two years". "He is currently performing at the same level of Alisson Becker but his stats are underrated." Calm down, he's played 10 games in the PL. I would also point out that the £72m Chelsea paid was due to it being somewhat of a panic but. Had they had more time to do business, I think that fee would have been less. @Block4Gooner thanks for that; the database details 3 x FA Cup and 4 x Champions League tickets; we have to detail the competition. What would be best, here? 3 x FA Cup and 3 x Europa League? @jkadms - thanks, I'll look into that. @diddydaddydoddy - sell-on is included, and also put in a definite Future Transfer to Besiktas; obligation to buy under those exact circumstances can't be replicated, via the database. I raised this in Dutch league thread as the file would only just have come over. Alireza Jahanbakhsh- I'm surprised he hasn't had a large boost at the end of last season? He has exactly the same stats as he had after the January transfer update. Top scorer and 12 assists in the team that only finished 3rd, also voted 2nd best player in the league. I bet his CA is some way off some of the players at PSV and Ajax, which is unfair. He's also not got full green as a right winger when he played 95% of his games there last season. Mathew Ryan- Agree with the reduction in command of area. Although he's had a bit of a boost elsewhere I think reflexes could go up another couple, his shot stopping compared to other premier goalkeepers is very low. He was very consistent last year after a the first 2/3 games. Lewis Dunk- Leadership could go up a couple to 14 now he has captained a fair bit more, flair has gone from 5 to 13 which I think is excessive, 9-10 would be ok. Agree that concentration has stayed low at 10 but his defensive stats, tackling and positioning are still low from last year. Marking is good at 13 but I think tackling should be 16 and positioning 15. The low concentration rating still gives him room for an error. He's just had a call up to the England squad, admittedly because a player got injured but it showed he's next in line and well thought of. There are the likes of Jack O'connell and Chris Mepham or have similar or better defensive stats in the game and they've only had one full season in the championship, let alone be in a team with the 9th best defensive record in the premier league last year. Gaetan Bong- Good he's had a bit of lift mentally and defensively, another +1 for tackling and positioning I think are deserved, hardly anything goes by him. Dale Stephens- +2 for positioning, strongest part of his game. Long shots could come down a little now. Please boost his DM rating to natural, Brighton play a 4-2-3-1 deep imo so should be natural there. Davy Propper- As per above with Stephens, Brighton play 4-2-3-1 deep, Propper played in the DM role all season. I don't think he should be natural as I think he's played out of position so accomplished would be good. Along with that his tackling of 8 should be around 11/12, he's already very good in the game though so would expect one or two of his mentals (except positioning) to drop to balance it out (his technicals are otherwise are all good). Pascal Gross- Increase vision and first touch, reduce tackling and pace. Great work with Glenn Murray btw. Oh and Percy Tau is valued at 20mil haha. Not quite sure how that worked out? Fix ben White's determination to something reasonable. I think playing the who of last season in league 2 and winning best player or something shows he's up for it. Brighton obviously struggled to get in a 4th CB this summer before signing Burns and they must have been comfortable in not getting him in until January, presumably because of how much they rate White. He only has a potential 3* at the start so potentially could have a boost. Max Sanders call up to England U19's and captaining the U23's, bigger boost and PA boost? thanks, @Spurs08 - those players now have that achievement listed in their respective profiles. That's appreciated, @RageMaster , thanks. Yes, please do post the list. I think a Cardiff’s debts are too high and don’t allow for the latest trache of debt converted to equity by Tan. As pointed out by others, the negative balance at the start of the game had triggered the taking out of a bank loan. I understand the methodology used to derive the current balances but surely if these are correct then there is an understanding that future cashflows will soon sort the situation? Rather than half the clubs in the division taking out loans? Additionally, understanding that database values can be blank for youth players, almost all of the Cardiff U18 and some U23 players have very low determination - less than 5 in almost all cases. I wonder if something is driving this but it feels unrealistic? Also as Wales manager I have been rejected for call ups by some players with dual nationality that are seemingly committed to Wales - notably Rabbi Matondo (link below) and Matt Smith (Captained side at youth levels). Bump on this as appears to have been lost amongst the arguement as to whether Alexander-Arnold’s crossing should be 17 or 15. It really does affect the long term finances i’m finding until i was taken over. As smaller point for Cardiff - James Waite should surely have MC/AMC in his positions, played there for a while now I think, including his pre season appearence with first team? This should mean that whichever European competition Arsenal are in, the correct number of games are included within the cost of the season ticket. The only potential issue I can see is a scenario where Arsenal drop into Europa League from Champions League, but it's a bit tough to legislate for that. Perhaps if that's the case, make it 4 x FA Cup, then 3 of each European competition. I've asked for this again but it hasn't been implemented. Apologies, @djole - I've amended Arnautovic's player history, as advised. Thanks, @MagicMike013, and sorry for not responding, sooner. I wasn't aware of the amount of debt that Vincent Tan had converted to equity, over the summer, and have now adjusted Cardiff finances to take that into account. I have taken on board your concerns, and those of others, regarding the negative cash balances, and will discuss ways, with appropriate folk in the coding department, in which we can improve the way we account for such expenditure. Matondo and Smith; I've now set those players as declared for Wales. I'll look into the situation regarding the randomisation of the values for "Determination" in the younger players. I have adjusted Waite's playing position ratings, too. That's great work, thanks, @RageMaster - those are all in the database, now, but I can't guarantee that they'll make it into the release version of FM2019. @Pete Sottrel Thanks, really appreciated how you huys take measured feedback on board. Great work. I would have him as a scout in the DB and assign him to Wolves' loanees to report back to the manager. I understand it's a hard role to fulfill though. Disagree. Man Utd seem to be rated very generously on this years game again. 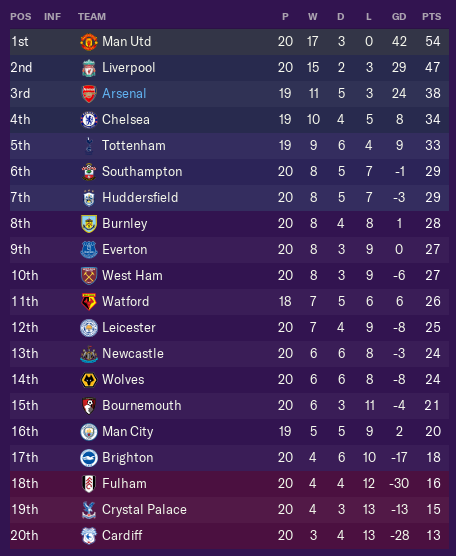 TBF I've only had one save on the beta but Utd are 6 points clear after 10 games. This was very similar to last years game where Utd would win the league pretty much every time, and then go on to dominate the league and champs league for the next 5 years. Either someone at SI loves Utd, or hates City. Or both. I certainly think that their Determination can do with an overhaul with 3 players with 19, 3 with 17, 4 with 16, and most others between 13-15. I would say that this one point they have not shown to the previous games this seasons with the last two league games in being the exception. Their consistency is also very high and has not been brought down to match performances this season. These are only too things i have noticed and why they are overpowered in game. There are also individuals who have world class attributes who do not warrant it imo. Rojo with world class tackling and marking for instance. Defensive this season they have been weak but the attributes of the defenders with very high determination, anticipation, tackling, bravery all suggest they are world class and do not leak goals and are playing superbly together. There is also an argument that their team work should be dropped and relationships with manger tweaked so that performance wise they are better reflected in game. 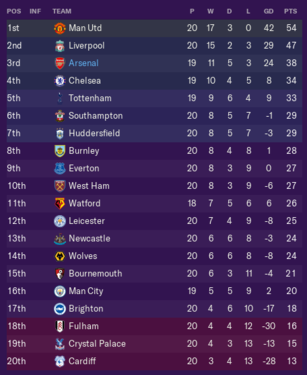 MU in my beta SAVE are top by 8 pts. liverpool are 5th City 2nd Arsenal 6th Chelsea 4th, Spuds 3rd. Whats the Ave of the best 16 players amungst the top 6 teams in terms of consistency, workrate, team work, determination? Whats the the ave ratings between the top 5 centre backs amungst the top 6 teams with regards to consistency, determination, positioning, tackling composure, anticipation, etc? Ive look using the IGE and im seeing MU top of the pile. Started as Man Utd tonight and most of the first team don't come back from holiday till late July or early Aug. I know they are coming back late but those dates are well too far and all other teams had players back start of July. I started another new game and they are set correctly now to 2nd July. Was a bug/glitch. The attribute page gives a late date while the squad screen when hovering over the "Hol" icon shows 2nd July. Also Dave Wright has joined Brighton from Portsmouth. Yeah the one save I’ve started had Jordan Pickford coming back August 3rd and I had Harry Maguire back with my normal team iirc. Jahanbakhsh does have a higher rating for AMR than AML, the green circle you are seeing is role suitability. I'm not too concerned about that. We don't see or set the role suitability in the database, it's just the games interpretation of his best role given his attributes. Ryan/Bong/Gross/Izquierdo - Fair points, will take a look. Dunk - I’m not convinced on Leadership. Yes he has captained the side on occasion but I feel that’s more a case of his position and having been at the club for such a long time. I don’t really see him as a leader myself. Flair – fair point, I’m not sure what I was thinking there. I’m not totally sold on Positioning 15 yet either, there’s an element of, “how good would it be if we played a higher line?”. Stephens - Fair points on positioning/long shots. I'm not convinced he should be a natural DM though. Similar with Propper. Also with Propper I feel like he mostly wins the ball through his reading of them game and interceptions rather than tackles, perhaps I have a blind spot. I’ll keep that in mind. Tau - Looks like his rep has gone up, I don't think that was me. Will see what we can do. White/Sanders - Ok, will have a look. Both have reasonable ability/potential already. White's ability has some direction from his staring role at Newport last season, Sanders doesn't really have that senior reference point. Can you add him to City as a Youth Coach? Or would he not appear in game? Kurt Zouma has 19 (!) acceleration. I haven't watched him often enough to suggest another figure but 19 acceleration should be reserved for the likes of Aubameyang and Yedlin.